Apophenia is the experience of seeing patterns or connections in random or meaningless data. The term was coined in 1958 by Klaus Conrad, who defined it as the "unmotivated seeing of connections" accompanied by a "specific experience of an abnormal meaningfulness". While observations of relevant work environments and human behaviors in these environments is a very important first step in coming to understand any new domain, this activity is in and of its self not sufficient to constitute scientific research. It is fraught with problems of subjective bias in the observer. We (like the experts we study) often see what we expect to see, we interpret the world through our own personal lens. Thus we are extraordinarily open to the trap of apophenia. In statistics, apophenia would be classed as a Type I error (false positive, false alarm, caused by an excess in sensitivity). Apophenia is often used as an explanation of paranormal and religious claims, and can also explain a belief in pseudoscience. Conrad originally described this phenomenon in relation to the distortion of reality present in psychosis, but it has become more widely used to describe this tendency in healthy individuals without necessarily implying the presence of neurological differences or mental illness. In the case of autistic spectrum disorders, including Asperger's syndrome and individuals who are autistic savants, individuals may in fact be aware of patterns (such as those present in complex systems, large numbers, music, etc) that are infrequently noticed by neurotypical people. Rather than being aware of patterns that do not exist, autistic individuals may be aware of meaningful patterns within situations that appear meaningless to others. 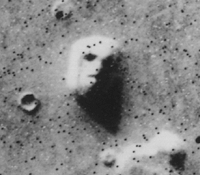 The identification of a face on the surface of Mars is an example of pareidoliac apophenia. Pareidolia is a type of apophenia involving the finding of images or sounds in random stimuli. For example, hearing a ringing phone whilst taking a shower. The noise produced by the running water gives a random background from which the patterned sound of a ringing phone might be 'produced'. Postmodern novelists and film-makers have reflected on apophenia-related phenomena, such as paranoid narration or fuzzy plotting (e.g., Vladimir Nabokov's "Signs and Symbols", Thomas Pynchon's The Crying of Lot 49 and V., Alan Moore's Watchmen, Umberto Eco's The Name of the Rose and Foucault's Pendulum, William Gibson's Pattern Recognition, James Curcio's Join My Cult, Arturo Pérez-Reverte's The Club Dumas, The Illuminatus! Trilogy by Robert Shea and Robert Anton Wilson, and the films Conspiracy Theory, Darren Aronofsky's π, A Beautiful Mind, The Number 23 and The Nines). In a sly reference to Moore's Watchmen, the conspiracy-obsessed superhero The Question is accused of suffering from apophenia in "Double Date," an episode of the animated TV series Justice League Unlimited. As narrative is one of our major cognitive instruments for structuring reality, there is some common ground between apophenia and narrative fallacies such as hindsight bias. Since pattern recognition may be related to plans, goals, and ideology, and may be a matter of group ideology rather than a matter of solitary delusion, the interpreter attempting to diagnose or identify apophenia may have to face a conflict of interpretations. Endslay, Mica R. (2004). Simon Banbury, Sébastien Tremblay. ed. A Cognitive Approach To Situation Awareness:: Theory and Application (1st ed.). USA: Ashgate Publishing, Ltd.. ISBN 0754641988. Sherlock, P. "On roulette wheels and monkies randomly inspired by Shakespeare", truth.gooberbear, April 1, 2008. Accessed April 1, 2008. William Gibson, 2003, Pattern Recognition. New York: G. P. Putnam's, 2003. ^ Brugger, Peter. "From Haunted Brain to Haunted Science: A Cognitive Neuroscience View of Paranormal and Pseudoscientific Thought," Hauntings and Poltergeists: Multidisciplinary Perspectives, edited by J. Houran and R. Lange (North Carolina: McFarland & Company, Inc. Publishers, 2001). This page was last modified on 8 April 2009, at 14:35 (UTC).